As the second season of Fox’s horror comedy Scream Queens rolls on, the upcoming episode entitled “Repunzel, Repunzel” was directed by genre icon and the show’s star Jamie Lee Curtis, who has documented her experience calling the shots through her social media accounts, posting a ton of cool behind-the-scenes photos from the set in recent weeks. 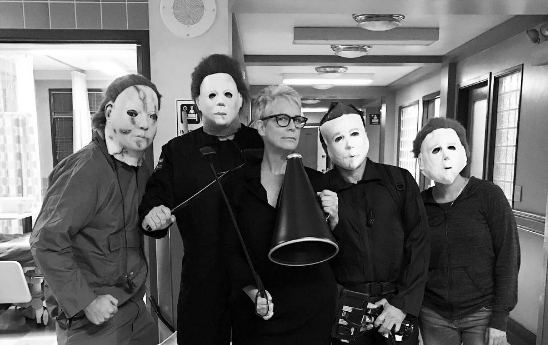 Halloween took on special meaning on the set of the series this year, as many of the crew members honored their leading lady by dressing up as Michael Myers. Scream Queens airs on Tuesdays at 8pm on Fox, and “Repunzel, Repunzel” directed by Jamie Lee Curtis will premiere this Tuesday, December 6. You can see some of our favorite behind-the-scenes posts from the set below! @screamqueensfox camera department honoring me tonight with a final head tilt. HAPPY HALLOWEEN WORLD!